Technically this album is a re-release. But the very rare 1971 original was so poorly mixed—and trashed up with obviously ersatz crowd noise from bullfights, no less—that Jimmy Page had it deleted. (With help from Peter Grant’s The Song Remains the Same mobster hit squad perhaps?) Page’s mega-potent remix is revelatory: a reminder of the wrecking-ball force that original Yardbirds Chris Dreja, Jim McCarty, and Keith Relf put behind Page’s white-hot and unhinged Telecaster flurries, and a startling peek at Zep’s origins. (“Dazed and Confused,” for example, is well on it’s way to becoming the Zeppelin version, but more feral here). There’s heaps of raging Telecaster and Tone Bender fire. (The sickest Page tone, in my book.) 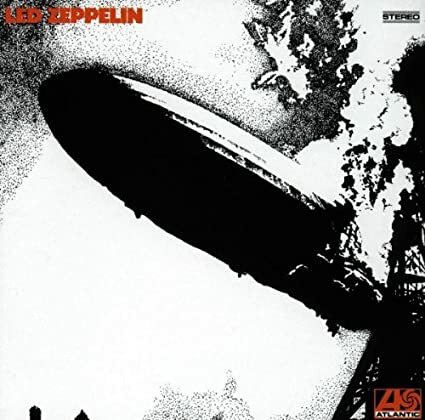 A second disc of abandoned studio sessions reveals other possible Yardbirds tangents later made whole by Zep, including a beautiful, breezy, California canyon-tinged take on “Tangerine.” This was easily the rock record I listened to most this year—especially on Friday and Saturday nights, when the neighbours had no reasonable expectation of quiet. In BECK01 Jeff Beck takes us on the journey of a lifetime. Over five decades, he has blazed a trail forging a unique style lauded by critics, fans and fellow guitar legends. Telling the story behind the music, Beck’s twin inspirations – hot rodding and rock’n’roll – are now bound together in the official signed limited edition book of his career. 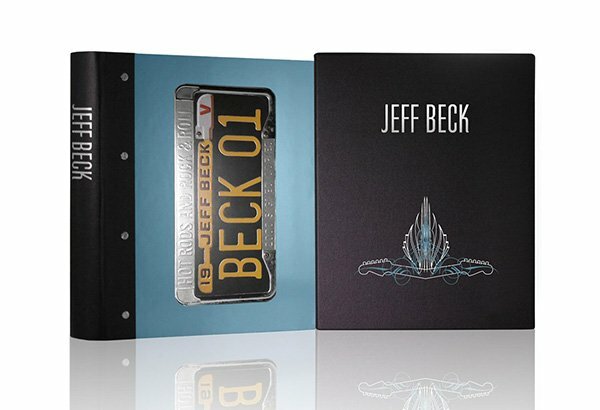 The first 350 books in Beck’s limited edition are Deluxe Copies. Each is lovingly handcrafted in Italian leather, presented in an archival solander case and includes an exclusive signed print suitable for framing. Each Deluxe Copy is numbered and individually signed by Jeff Beck. Beck’s remarkable life in music is documented through the work of top photographers including Robert Knight, Baron Wolman, Bob Gruen, Michael Putland, Barrie Wentzell, Gered Mankowitz, Neil Zlozower and Michael Zagaris. Influential magazine spreads, set lists, posters and record sleeves further illustrate Beck’s words. 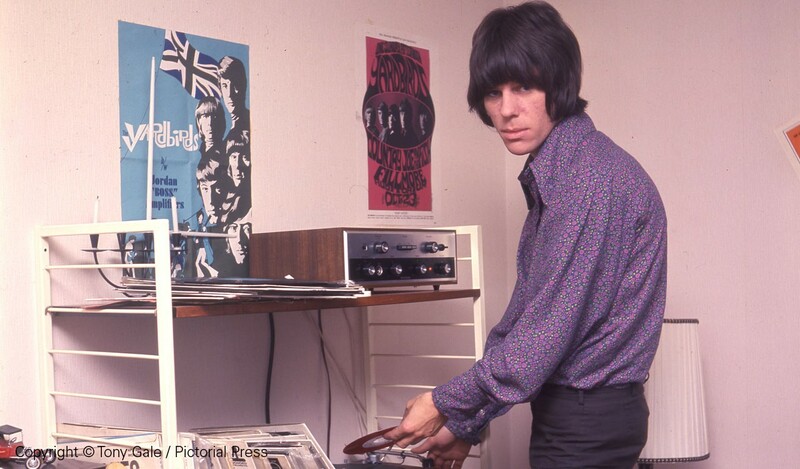 ‘Jeff Beck has been a hot rodder for decades. Upon first examination this seems at odds with our image of Jeff Beck, the musician. But to Jeff, it makes perfect sense. The common thread is that in the post WWII world in which he grew up, all roads led to an America flush with a new energy fuelled by the youthful adrenaline of rock-and-roll music and hot rod automobiles.’ Steve Coonan, hot rodder magazine editor and author. Whether you mark the genesis as the death of The Yardbirds, the Scandinavian tour by The New Yardbirds or the band’s first show under the new name, Led Zeppelin’s birth, however gradual, takes place in 1968, on way to its crowning moment, the release of the band’s self-titled debut not two weeks into the new year, January 12th of 1969. The story arguably begins back in 1966, when Jimmy Page joined The Yardbirds, first on bass as replacement for Paul Samwell-Smith, but then switching to guitar, where he shares those duties with Jeff Beck. Beck was soon to depart, in October that year, Jimmy’s thoughts wandered off to bigger things, a supergroup of sorts, while he bides his time for nearly two more years with an act proving to be somewhat directionless. 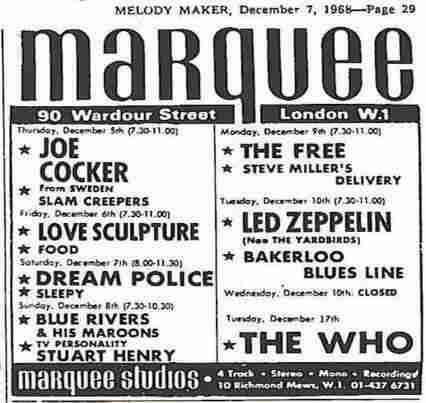 The Yardbirds would play their final show, a Bedfordshire gig, in July of 1968. At this point Jimmy is already in possession of most of the riffs and song ideas he would need in his next incarnation. But in the summer of ’68, The Yardbirds, now splitting up, but nonetheless still committed to a Scandinavian tour. A new lineup to fulfill these dates was called for. After Chris Dreja bows out to begin a career as a photographer, session stalwart John Paul Jones is recruited. In the all important vocal slot, Jimmy had wanted on the team Terry Reid, but Reid demurs, suggesting a young Birmingham singer named Robert Plant. Robert is the one who brings along local drummer and hard-hitter John Bonham. Before the new foursome would hit the road, they perform a session for the P.J. Proby album Three Week Hero. A track there called “Jim’s Blues” would live on as the band’s first session together, on the technicality that Robert is present blowing some harmonica. Original Judas Priest vocalist Al Atkins happened to be there to watch the formation of what would be called The New Yardbirds, the makeshift name the band used to fulfil those Scandinavian dates. “I used to know Robert,” says Atkins. “We used to go for a beer together, and sometimes he’d borrow my microphone because he couldn’t afford one, if I wasn’t playing. We had one mic between the two of us. I had the best one. And a buddy of mine, ‘Are you playing tonight?’ ‘No, oh go on.’ It was great times. Robert’s roots have always been blues. He’s a very intelligent guy when you’re talking to him about the blues stuff. He knows everything about that. You can’t argue with him about anything on that subject. But I saw him before Zeppelin, when he was playing at Henry’s Blues House and Alexis Korner was playing on his own, a solo gig he got there, like a one-man band thing or something, and Robert got up and played harmonica and sang along with him. But in August of 1968, even before the band’s dates in Scandinavia, Jimmy’s Yardbirds mate Jeff Beck would release his album Truth, which many a rock historian debate as the blueprint for what Led Zeppelin would become. In any event, 1968, as it pertains to the birth of the band, is next marked by the first show on British soil, October 4th at the Mayfair Ballroom, Newcastle upon Tyne. Conducting a brief British tour, the next benchmark is the band’s first show under the new name — Chris Dreja had issued a cease and desist order on the use of The Yardbirds moniker — on October 25th, at the University of Surrey in Battersea. And for the record, as the story goes, the band chose for its new title Led Zeppelin, because John Entwistle had suggested to Jimmy that his new “supergroup” would go down like a lead balloon. Into November, rough and tough manager of the band Peter Grant negotiates a $143,000 advance for his boys from Atlantic Records and the hype machine lurches into operation, never to wane across a full decade of dominance. Millions across the planet were soon to feel equally staggered, but again, the groundwork and indeed so much more, was set in 1968, and really, much of it packed into the back half of the year. The breakdown in communication that caused the demise of The Yardbirds to the recording of “Communication Breakdown” takes no more than an astonishing four months, and by the end of the year, is a record that will forever change rock ‘n’ roll. Fully 50 years later, the impact of Led Zeppelin is still reverberating. “Dazed and Confused” is a song written by American singer-songwriter Jake Holmes in 1967, It was described as “a stark, spooky folk-rock track with stinging reverbed lead guitar, Holmes‘ own pained vocals, and furiously strummed rhythm guitar that winds itself into an anguished climax. Holmes recorded the song for his debut album “The Above Ground Sound” of Jake Holmes and he performed it in the late 1960s and early 1970s on the New York City folk scene and the college coffee house circuit. The lyrics refer to the effects of a girl’s indecision on ending a relationship. This version from Live Supershow 1969 . In August 1967, Holmes opened for the Yardbirds at a Greenwich Village gig in New York. According to Holmes, “That was the infamous moment of my life when ‘Dazed and Confused’ fell into the loving arms and hands of Jimmy Page.” When the track appeared on Led Zeppelin’s eponymous debut album in 1969, Holmes was aware of it at the time, but didn’t follow up on it: “In the early 1980s, I did write them a letter and I said basically: ‘I understand it’s a collaborative effort, but I think you should give me credit at least and some remuneration.’ But they never contacted me. 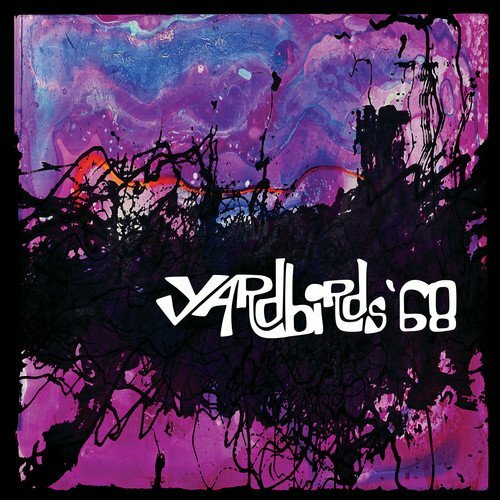 After hearing Holmes perform the song in 1967, English rock group the Yardbirds reworked it with a new arrangement. It became a centerpiece of the group’s tours in 1968, several recordings of which have been released. “Dazed and Confused” was further adapted later that year by Yardbirds guitarist Jimmy Page’s “New Yardbirds” group (soon to be rechristened Led Zeppelin) for their debut album, Led Zeppelin. “Dazed and Confused” became a concert staple with solos that sometimes stretched the performances to 45 minutes. When the Yardbirds disbanded in 1968, Page planned to record the song in the studio with the successor group he had assembled that summer. 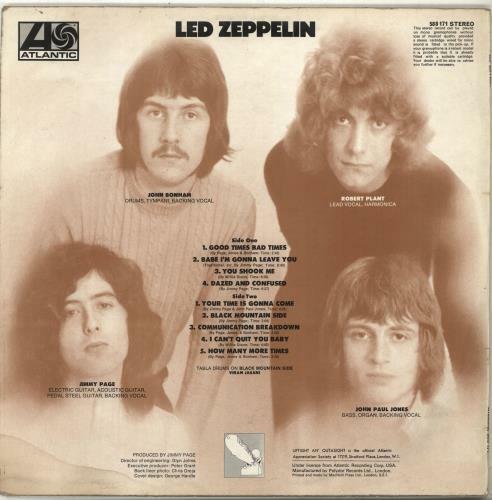 According to Zeppelin bassist John Paul Jones, the first time he heard the song was at the band’s first rehearsal session at Gerrard Street in London, in 1968: “Jimmy played us the riffs at the first rehearsal and said, ‘This is a number I want us to do’.” The future Led Zeppelin recorded their version in October 1968 at Olympic Studios, London, and the song was included on their debut album Led Zeppelin (1969). 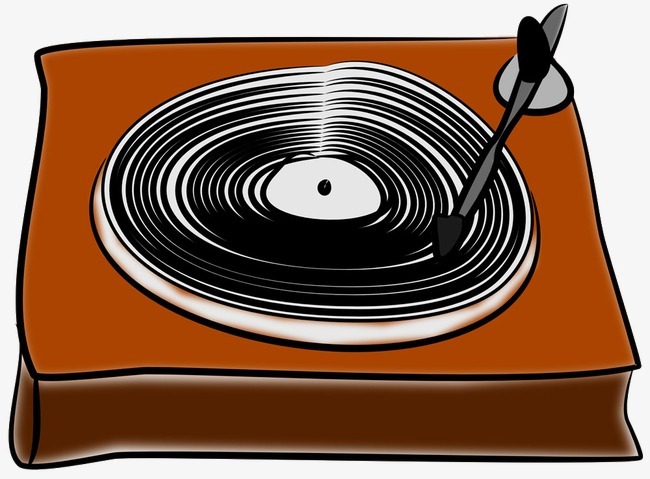 “Dazed and Confused” was the second song recorded at the Olympic sessions. Page recorded the song in one take with a Telecaster and violin bow as he had performed it with the Yardbirds. Singer Robert Plant wrote a new set of bluesier lyrics, according to Page, though Plant is not credited on the album. Other sources say Page wrote the new lyrics himself. Whichever the case may be, Plant’s vocal is raw and powerful, delivered with “unrelenting passion.”Other than the lyrics and vocal, the song remained very similar to that performed by the Yardbirds earlier that year. Humble Pie were an English rock band formed by Singer Steve Marriott , in Essex during 1969. They are known as one of the late 1960s’ first rock supergroups and found success on both sides of the Atlantic. The original band line-up featured lead vocalist and guitarist Steve Marriott from the Small Faces, vocalist and guitarist Peter Frampton from The Herd, former Spooky Tooth bassist Greg Ridley and a seventeen-year-old drummer, Jerry Shirley. The groups concerts around this time featured an acoustic set, with this radical re-working of Graham Gouldman’s “For Your Love” as its centrepiece. The rock band Humble Pie from England with their song “For Your Love” live on German TV for Beat Club, A band just dripping with talent who never got their just dues. A warm,loving version of the Yardbirds classic done to perfection. This is the first of the 3 clips (in HD) from the “Bouton Rouge” French TV show hosted by Pierre Lattès on 9th March 1968. This is the second of the three clips (in HD) from the “Bouton Rouge” French TV show hosted by Pierre Lattès on 9th March 1968. This is the last of the three clips from the “Bouton Rouge” French TV show hosted by Pierre Lattès on 9th March 1968. 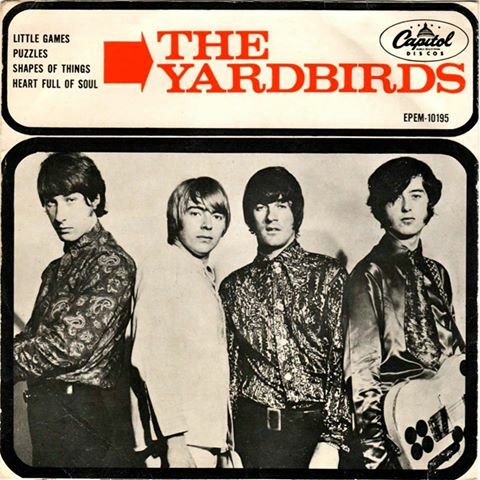 The Yardbirds were an English rock band that had a string of hits in the mid-1960s, including “For Your Love”, “Over Under Sideways Down” and “Heart Full of Soul”. 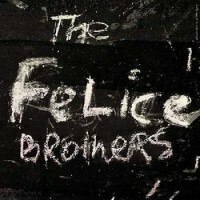 The group is notable for having started the careers of three of rock’s most famous guitarists: Eric Clapton, Jeff Beck and Jimmy Page, all of whom are in the top five of Rolling Stone’s 100 Top Guitarists list. They are a blues-based band that broadened its range into pop and rock, the Yardbirds had a hand in many electric guitar innovations of the mid-1960s, such as feedback, “fuzztone” distortion and improved amplification. Pat Pemberton, writing for Spinner, holds that the Yardbirds were “the most impressive guitar band in rock music”.After the Yardbirds broke up in 1968, their lead guitarist Jimmy Page founded what would become Led Zeppelin. The Yardbirds performing “Stroll On” taken from the classic Movie “Blow Up” with Jimmy Page and Jeff Beck on guitars, theway everyone in the audience is staring rather than grooving or dancing to the beat must have been hard.